Note: this element pak is included in the full Sportin' It Page Pak. Love to play sports and be active??? 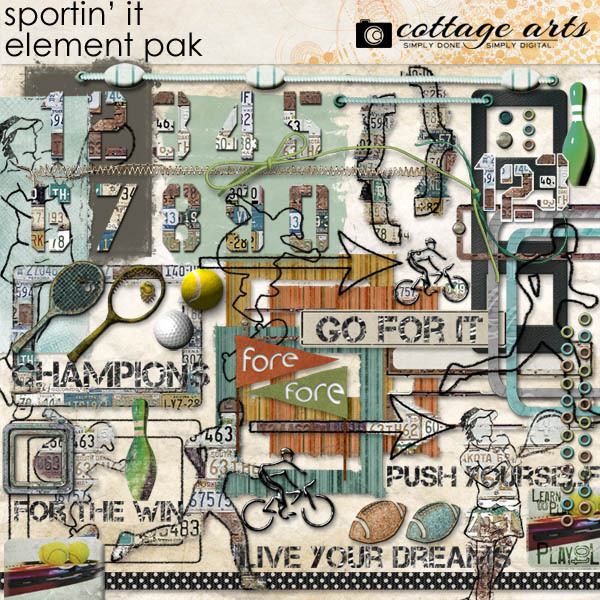 Scrap your athletic memories with this ruggedly awesome kit...features running, football, tennis, track, skateboarding, swimming, cycling, biking, golf, and any general athletic activity. See all of our sports kits here. 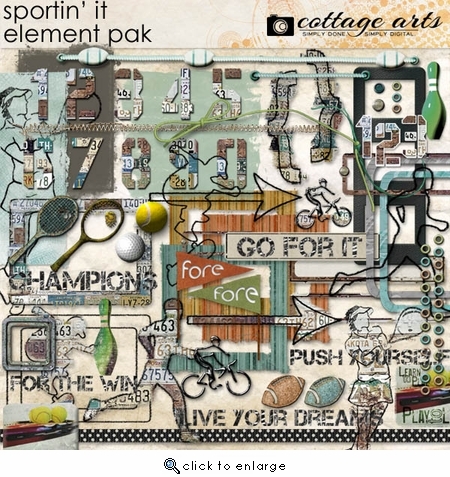 Includes over 60 uniquely athletic elements: Stencil License Plate Numbers (0-9), 4 sketched athletes and 4 grunge license plate filled athletes (cool! ), frames, ribbons, 2 fore golf flags, golf ball with and without 3D shadow, tennis ball with and without 3D shadow, arrows, urban license plate frame, 2 click.masks for your photos, stitching, 4 stencil cut glass word art titles (6 inches each), eyelets, brads, bookplates, journal mats, and more! Includes links to our on-line Clipping Mask and Realistic Drop Shadow tutorials.